MANDALAY – Restoration work on one portion of Mandalay’s famed Shwe Nan Daw Kyaung monastery has stalled due to a conflict over the best method of reinforcing the weak and decayed floor of the building. Experts from the World Monuments Fund (WMF) and the Department of Archaeology and National Museums have different ideas on how to proceed with the reinforcement, especially underneath the historic monastery’s west veranda, causing the two teams to delay the start of restoration work. The WMF experts have proposed using logs to reinforce the column underneath the west veranda, while department officials want to use steel pipes — an option the WMF strongly opposes. “In general, wood and steel bracing are meant to be temporary. 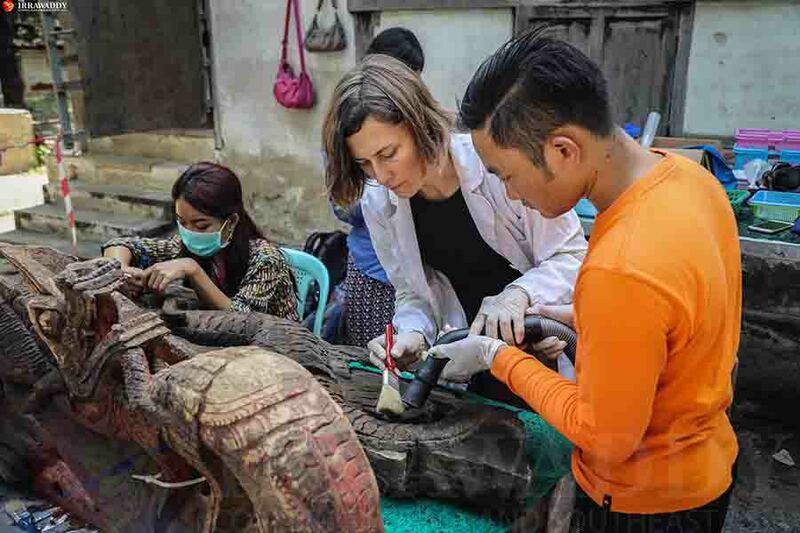 But they want to use these as permanent, which we cannot accept in restoration of historic wooden buildings,” said Jeff Allen, the WMF’s project director of preservation at Shwe Nan Daw Kyaung Monastery. “I often try to figure out where this kind of steel pipes on historic buildings idea comes from. But in Myanmar it often is seen as the final solution for a monument. We can see examples in restoration in Bagan, done by the generals,” he added. The WMF said authorities from the department seem not to want to replace the wood, but would rather support the wooden building with steel pipes — something that violates the Fund’s standards. “Following international standards of preserving heritage [sites], we will only use wooden logs for wooden buildings, not steel pipes,” Allen said. “If we can finish Shwe Nan Daw Kyaung the correct way, it will be an example for all Burmese people about how important it is to preserve the knowledge of the past to help us solve problems today,” he added. According to the WMF, restoration of the Nayas, the mythical features that decorate the base of the monastery’s columns, is ongoing. Only the reinforcement of the verandas has been halted. The standoff has been brought to the attention of the regional government, which plans to act as a negotiator between the two parties. “If they decide to use steel pipes instead of wood, we will not do the restoration of those parts. I can understand that what we talk about and want to do is so foreign and alien, especially for conservative types of people; that is why we must be patient until they accept us,” Allen said. According to a regional government source, officials are examining the situation and plan to call a meeting of all parties involved in restoration projects at the monastery in March. Restoration work on the monastery resumed in November after a delay of about a year due to a hold-up in grant money. A joint project between the Culture Ministry, the WMF and the U.S. Embassy, restoration began in February 2014, funded by the WMF. The project was initially expected to take two years. There were major delays in September 2014 due to hold-ups with the supply of teak logs that are to replace some of the monastery’s decaying pillars. Major restoration work began in January 2016, only to be suspended again due to the shortage of funds. Further support for the preservation project came from the U.S. Ambassadors Fund for Cultural Preservation, which joined hands with Ministry of Culture. The Shwe Nan Daw Kyaung Monastery, a 19th-century traditional teak wood building, was originally covered with gold leaf and glass mosaics, and is known for the intricate wood carvings on its walls and roofs showing Buddhist myths. It was built as a royal chamber for King Mindon and located within the Mandalay Palace complex. Under Mindon’s son, King Thibaw, the building was moved to a site outside of the Mandalay Palace moat and turned into a monastery. During World War II, aerial bombardments destroyed most of the historic buildings inside the Mandalay Palace complex, leaving the Shwe Nan Daw Kyaung Monastery as the only remaining original structure from the 19th-century palace. In 1996, Myanmar’s Archaeological Department submitted the monastery for inclusion on Unesco’s World Heritage List, where it remains under consideration by the UN body.